Few people actually open and edit documents on their smartphones, let alone actually create them there. From a short-term perspective, then, placing a version of Microsoft Office on Apple's iPhone shouldn’t dramatically change the world. 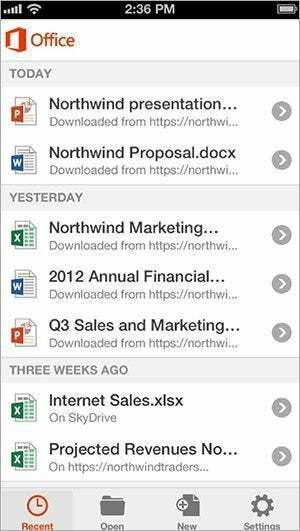 Microsoft announced Office Mobile for iPhone on Friday morning, ending months of speculation. The “free” Office Mobile for iPhone app only works with an Office 365 subscription, however, so users will have to pay to edit Office documents, whether it be an Office 365 subscription or Apple’s own $9.99 productivity apps, iWork. And, for now, Office Mobile is specifically formatted for the iPhone, so iPad users won’t be able to use it. 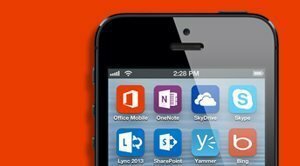 Office Mobile for iPhone users will only be able to open and edit, not create, documents in Word, Excel, and PowerPoint, although a Microsoft-supplied graphic shows the other standalone apps available for the iPhone: Lync, SharePoint, Yammer, and Skype. Outlook appears to be missing, although the Outlook.com app somewhat fills that hole. A dedicated SkyDrive app is also included, which appears to be the only option for cloud storage. That could be a real sticking point if Microsoft doesn't allow documents to be saved to iCloud or imported from there. From a broader perspective, however, Office Mobile on the iPhone represents a foothold by Microsoft onto the broader iOS platform, which represents an opportunity to push Microsoft's idea of Office wherever you are, said Wes Miller, an analyst with Directions on Microsoft. In some sense, it’s the complement to Microsoft’s newfound direction of Windows Everywhere. ”This would be an important announcement for Microsoft to confirm their intent and commitment for Office and other platforms,” added Michael Silver, an analyst with Gartner. Microsoft characterized Office 365 on Mobile as an added benefit for Office 365 subscribers. "Office Mobile is another great example of the value of subscribing to Office 365, and I can guarantee you, there will be lots more to come," Julie White, the general manager of Office, said in a blog post. What does Apple get out of the deal? That’s a more difficult question to answer. If nothing else, Apple users get access to the “official” version of Office. But although Apple’s iWork suite for the iPhone and iPad may be getting a bit long in the tooth, according to analysts, there’s also no indication that Apple plans to discontinue it, either. In fact, Apple announced a new iWork for iCloud version is due later this year, along with new versions of iWork for the Mac and iOS. Office Mobile for iPhone requires either an iPhone 4, 4S, and 5 or iPod Touch 5th generation. It also requires iOS 6.1 or later, Apple says. A list of files stored within Office Mobile for iPhone. ”I don’t know if Apple gets anything out of it, because I don’t know that people weren’t buying Apple products because they coudn’t get Office on it,” Silver said. It might be different if Microsoft supports Office on the iPad, he said. The key appears to be that in restricting Office to the iPhone, Apple leaves the iPad an exclusively iWork platform—unless users want to access the Office Web Apps via the Safari browser, that is. Shipping a version of Office for either iOS or Android devices has been the subject of rumors for months. Early reports had indicated that it wouldn’t happen until the fall of 2014, although the possibility has been discussed for the better part of a year. That’s left the door open to third-party developers, including everyone from CloudOn to OnLive, to bring Office to the iPad and other platforms. Microsoft already ships a version of Office for the Mac platform, although the suite, Office for Mac 2011, is generally considered to be a year behind the Windows version. A version of Microsoft’s Office 365 is also available for the Mac, with the 20 GB of SkyDrive storage and 60 minutes of Skype calls available to Windows users. But, at its heart, it’s the same Office for Mac 2011 suite that Mac users can buy as a standalone package. In the future, Microsoft may hope to push Office to the remainder of the iOS ecosystem, including the iPad, which is suited more for productivity than the iPhone. And then there’s the Android world, which would represent the final frontier for Office. Microsoft Excel for Office Mobile for iPhone. "I think that there's always a question about whether the Office product group is there to sell Office products, or there to prop up Windows, and the more time we go before we see an iPad version or an Android version, the more that comes into question," Gartner's Silver said. "An iPhone version really isn't proof of that. Again, I'm not sure how many people are going to want to do a lot of Office work on a phone. A tablet's going to be a lot more important." According to Miller, iWork isn't really an option for even the smallest of businesses, which will welcome Office. An updated version of Office for the Mac is reportedly due in 2014, although Miller said he'd heard nothing official. But for now, merely pushing Office into competition with Apple’s iWork suite is achievement enough. No mobile platform is entirely “pure,” in the sense that it’s isolated from other services. Outlook.com exists as an Android app. Windows Phone can now tap into Google’s YouTube. And the iPhone has both a Gmail app, Google Maps, and now Office as well. Windows Phone, however, has but a small percentage of the market share that the iPhone does, so relatively few people use Office Mobile on the Windows Phone platform. If Microsoft really wants to push the concept of mobile Office, it's going to have to do so via the competition. Office on the iPhone is an important first step for Office, and a giant leap away from Windows onto other platforms. But the other foot has yet to fall.